Learning to play and more! FAQ: How can I benefit from playing the piano? There are actually several benefits to playing the piano that are very surprising, such as a better response to criticism or better school grades/behavior. Other things include strong hand muscles and a more social personality. You may even handle stress better (though not in my case). How about a piano player's average salary? A piano teacher in a grade/music school can earn an average of $45-50,000 a year. 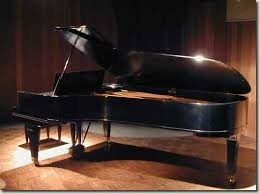 A full time piano performer can earn between $24-94,000 every year. 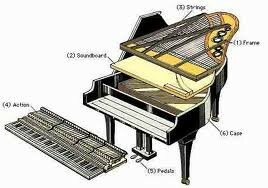 Are there different parts to a piano? There are several main parts in a piano, and they all work together to produce beautiful music. Here are just a few. Keyboard- what makes a piano a piano. The full set of keys. Lid- keeps what makes the sound hidden. Lifting the lid on a grand will increase volume, while not the same for a studio. 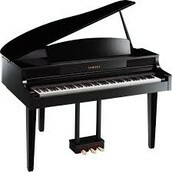 Keys, strings, hammers- What produce the sound of a piano (unless using an electric keyboard). When a key is pressed, a hammer inside the piano is pushed up to hit a string. Each string is a different size, therefore there are different sounds. Pedals- 3 pedals at the bottom of every piano, whether a keyboard or a baby grand (some pianos may only have 2). Left pedal does nothing, middle makes the sound softer, right holds the note until you let go. 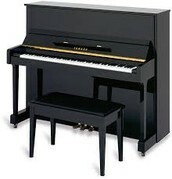 Are there different types of pianos? The truth is, there are so many different kinds of pianos, its hard to name them all. Most are categorized into two different sections, horizontal and vertical, with even more under those categories. One of the vertical kinds of pianos. It is called a vertical because of its structure. Largest of pianos. Categorized in the horizontal piano section because it takes more room horizontally. 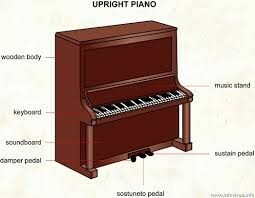 Vertical pianos came sometimes be called upright pianos.